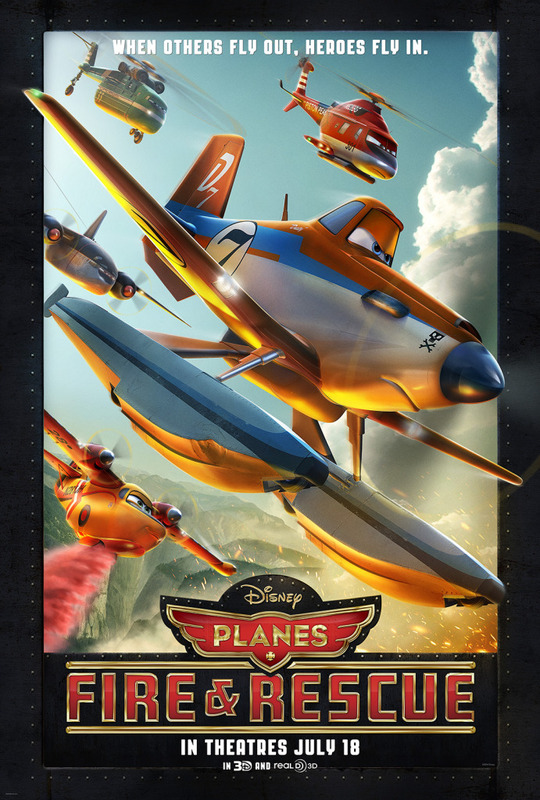 Though its story plays it safe, Disney’s Planes: Fire & Rescue soars when it counts, delivering family-friendly thrills and eye-popping visuals while paying homage to the courage of real-life smokejumpers and firefighters. It’s certainly not in the class of the most memorable Disney and Disney/Pixar computer-animated features, but it is a fun and well-meaning film that actually eclipses its predecessor in terms of what it has to offer to viewers young and old alike. While last year’s Disney’s Planes was a sports/racing film, Planes: Fire & Rescue takes the series in a more action-oriented direction. The story focuses once again on Dusty Crophopper (voiced by Dane Cook), who in the last film left behind his life as a cropdusting plane for the thrills and glory of air racing. Now a well-known champion racer, Dusty wants nothing more than to keep enjoying life at full-throttle, winning races, signing autographs, and thrilling crowds with his aerobatics and derring-do. But his career hits a snag when his engine gearbox, pushed far beyond its design limits by all the high-speed flying and maneuvering, begins to fail him. Since his is an older-model gearbox no longer readily available for replacement, it suddenly looks to Dusty and his friends that his racing days might be done just as they’d really begun. Dusty’s personal crisis coincides with a threat to his hometown airfield, as an accident at Propwash Junction leads to a review of its safety procedures. Propwash and its residents are then faced with the need to give its old-timer firetruck Mayday (voiced by Hal Holbrook) a serious upgrade, and also required to have on hand a second certified firefighter, or else be forced to close down. When Dusty learns from Mayday that cropdusters just like him were among the first planes recruited as aerial firefighters, he volunteers get certified as a SEAT (Single Engine Air Tanker) in order to save his home. He travels to Piston Peak Air Attack Base to train under the tutelage of veteran fire and rescue helicopter Blade Ranger (voiced by Ed Harris) and his air attack team. While learning the ropes, Dusty finds himself fending off the assertive affections of air tanker Dipper (voiced by Julie Bowen), a star-struck fan who hopes to get much closer to her idol than perhaps he’s ready for, and also courted for his celebrity by Spinner (John Michael Higgins), the local park superintendent who’s hoping to wow his bosses and local tourists with the grand opening of a newly-renovated resort lodge that took most of Piston Peak’s operating budget to complete. All that attention just serves to earn Dusty even more scrutiny and skepticism from Blade Ranger, who for his own reasons takes the job of fighting wildfires and saving lives a bit more seriously than the others, and just doesn’t think Dusty’s cut out for it. Dusty’s resolve and the courage of the whole team are soon put to the test when a massive fire suddenly threatens the lodge and the tourists staying there. Mentor, rookie, and team must then put aside their differences and put their lives on the line to do their jobs, all in the face of roaring, leaping flames, exploding trees, and blinding, suffocating smoke. Yes, densely-plotted it certainly isn’t, but for the film’s target age range, Planes: Fire & Rescue has plenty of eye candy and goofy voices to keep the laughs coming. The grown-ups in the audience should get quite a few chuckles, as well, especially if they lived through the late 70’s-early ’80’s and recall a certain now-iconic buddy motorcycle cop TV show that gets a little love in a key scene. Keen eyes will also catch some of the clever staging and sight gags put in place by the animators: a trash can included in just about every shot involving Spinner, rotor blades, tail fins, and other aviation-associated bits and pieces incorporated into the production design, and much more. It’s clear that director Bobs Gannaway and his team of DisneyToons animators hoped to create a film experience that would reveal something new with repeated viewings, perhaps aware that parents might be subjected to numerous viewings of film due to child demand. Easily, the most impressive aspects of this production are its numerous fire and water effects shots, which are nothing short of breathtaking, as well as its flying sequences, many of which involve aerobatics far more complex than anything orchestrated in the first Planes film. That along with the attention to detail regarding just how aerial firefighting teams and smokejumpers do their jobs and how it’s all incorporated into the film are testaments to both the volume of research that went into the making of Planes: Fire & Rescue, as well as the filmmakers’ reverence and respect for the real-world inspirations for their story. It’s a shame that the same level of commitment wasn’t paid to crafting a story with more depth and originality. It might have resulted in a far more memorable and emotionally resonant film. But then again, this is Disney, and in particular its the Disney team that until very recently was responsible for churning out budget-conscious direct-to-video sequels to the studio’s major box office hits. In that context, it’s probably best to enjoy Planes: Fire & Rescue for what it is, rather than dismiss it for what it isn’t. The kids certainly will, given the opportunity. Starring the voices of Dane Cook, Ed Harris, Julie Bowen, Curtis Armstrong, John Michael Higgins, Hal Holbrook, Wes Studi, Brad Garrett, Teri Hatcher, Stacy Keach, Cedric the Entertainer, and Danny Mann. Directed by Bobs Gannaway. Rated PG for action and some peril.